Azzun village is located 3 km to the east of Qalqiliya city. It was one of the active trade centers due to its closeness to the Armistice Line (Green Line) and as a passage way to Israel's proper. 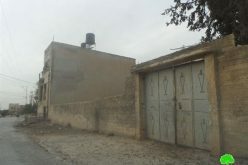 Following the outbreak of the second Intifada in September 2000, the village was completely sealed off by the erection of dozens of checkpoints, road blocks and metal gates. Azzun, like its neighboring Palestinian villages in the area, has suffered from the construction of the Segregation Wall on it lands. Currently, the Israeli occupation forces are building a 1140 meters long by 100 meter wide wall section in the southeastern part of the village. 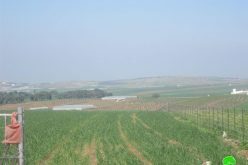 It is also expected that the wall will isolate about 460 dunums of fertile lands as a preliminary step before total confiscation and annexation to the near by Settlement of Ma'ale Shomron (established over 400 dunums of Azzun village lands in 1980 and houses a total population of 549 in 2004- source Foundation for Middle East Peace). The targeted lands are cultivated with olive and citrus trees and are considered one of the most fertile pieces of lands affiliated to Azzun. The currently under construction Wall section is among the five sections being built deep inside the West Bank around the settlement of Ariel under the name of Ariel fingers. Israeli Settlers from Ma'ale Shomron (located in the south eastern corner of the village) opened their sewage systems and waste water canals at Palestinian agricultural lands areas taking advantage of the Israeli closure on the village and the prevention of Palestinian farmers and lands owners from reaching their lands targeted by the wall, especially after wall constructions started in the area. The targeted lands are located in the southwestern side of the village where shallow marshes of sewage water have been formed causing damage to agriculture. At the same time, all sewage collection pools located at the northwestern side of the Ma'ale Shomron settlement have been totally filled with sewage water. Palestinian Farmers fear that when rain falls, flooding will reach their agricultural lands and cause damage. 1. So far, about 40 dunums have been damaged and all are located in the following areas of Azzun: Khallet Abu Zeina, Al Kafan, Wadi Al Qara'I and At Tarbi'ia to the east of the village. 2. The sewage pools are only 500 meters away from the main south artisan well providing 70 M3/hour of drinking water. It is very likely that this well is going to be contaminated. Mr. Adel Shaker Shubeita and Mr. Jihad Rashid Abdul Jawad, two Palestinian farmers from Azzun village and are victims of this tragedy. 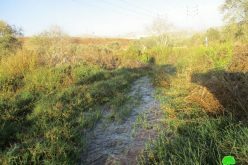 They have lost most of their olive orchards due to Wall constructions, and, yet, the rest of their agricultural lands are threatened with contamination by the pumping of sewage water. They have no other means to live on and sustain the life of their two families after they had lost their jobs inside Israeli following the outbreak of the second Intifada. 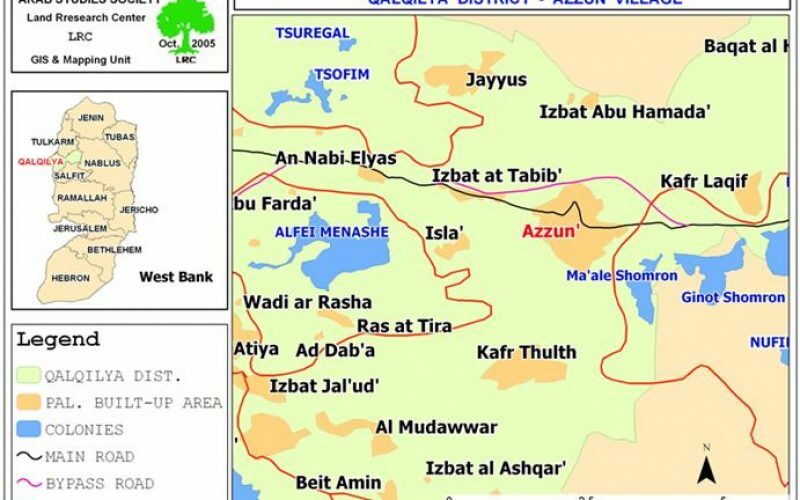 Azzun Municipality has forwarded an appeal to all concerned parties, including international and local Human Rights organizations, the Palestinian Ministry of Agriculture, the Palestinian Ministry of Local Rule and the International Committee of the Red Cross. However, no positive response has been received yet. In the year 1980, the Israeli occupation authorities forcibly occupied a piece of land between the villages of Jayyus and Azzun on the main Tulkarem road and used it as a regional dumping site for Israeli settlements, industrial areas and border cities such as Kfar Saba. The land is owned by Jayyus people. The dumping site is located only 700 meters from Azzun and Jayyus villages, 500 meters form Sir/ Jenin, amidst agricultural lands. In addition, this dumping site is only 400 meters away from Azzun water well (70 M3 / hour) which provides the residential areas in Azzun, Jayyus, Sir and Izbat At tabib with drinking water. See photo 1: part of the dumping site in Azzun. Results of water analysis' samples from this well conducted by Al Najah National University during the period of 1996-2000 indicated high percentages of salt, lead and Cadmium (CD) which cause health hazards in the human body. See Photos 2, 3, 4: some of toxic poisonous material thrown in the dumping site – Azzun. More environmental and health examinations were also conducted during the period from 2002-2003 confirming that the whole area suffer from ecological pollution because of the afore-mentioned dumping site. Such pollution causes many diseases, including muscle paralysis, sight disorders, high blood pressure and respiratory problems leading, on the long run, to lung cancer especially amongst elderly people. In Azzun village, for example, a sharp increase in cancer deaths was registered in 2001-15 cases; in addition to dozens of sick people who are under treatment. The number of cancer deaths jumped to 20 cases since the beginning of this year. photos 5,6,7: more barrels of toxic and chemical material contaminating environment in Azzun.,,: more barrels of toxic and chemical material contaminating environment in Azzun. Child Khaled Hijazi, 6 years old, from Azzun, suffers mentally retards ever since he was born. Medical tests conducted at Hadasah Medical Center in West Jerusalem and Jordan University Hospital in Amman proved that his mother had inhaled gases flowing out from the dumping site during her pregnancy period which was the main cause of his illness. Many similar cases are existed also in the aforementioned Palestinian villages. Although the Israeli occupation authorities stopped using this dumping site three years ago due to lack of space, no measures, whatsoever, have been taken to restore the situation back to normal and end this ecological disaster. In September, 2004, the Palestinian Environment Authority conducted an analysis on the dumping site which showed the existence of 17 internationally prohibited chemical substances affecting people, underground water, environment, agriculture and livestock. Amongst these substances are the following: Asbestos, Pyroxene, organic Potassium and others. See photos 8,9,10: the same rubbish dump with more dangerous material.,: the same rubbish dump with more dangerous material.,,: the same rubbish dump with more dangerous material.